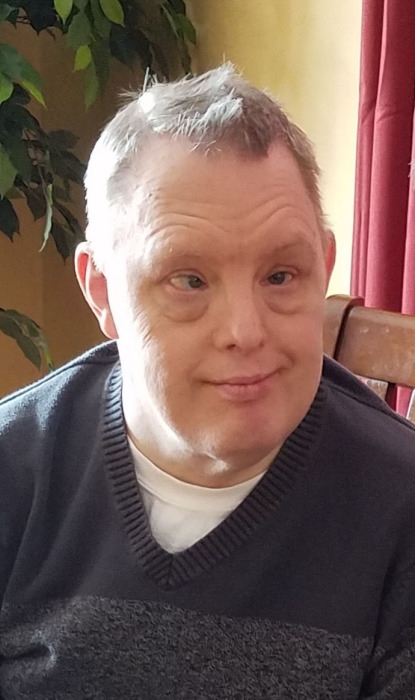 Steven Edward Anderson, age 64, of Madison and Appleton, Wisconsin, passed away after a brief illness at his wonderful caring assisted living facility in Menasha. He was born September 25th, 1954, in Niles, Michigan to Helga Minna (Nee Schuetze) and Bert Thomas Anderson. Born with Down syndrome, at the time a condition completely misunderstood, his parents were asked to consider institutionalizing him. He was given a life expectancy of 11 years. His parents refused and raised him on their own along with an older brother, Fredrick William Anderson, and a younger sister, Dorothy Ruth (nee Anderson) Witzeling. After moving to Appleton, Steven was one of the first students at an amazing new school for children with disabilities, Plamann School. He continued his education and graduated from Badger School in Madison after the family relocated. After graduation he worked in sheltered workshops in Madison, and again in Appleton. He retired from Valley Packaging, Inc. in 2012 after working for 38 years! He lived with his parents until his mother passed away, and then moved to Appleton where he lived with his sister, her husband, Daniel Edward Witzeling, and their family, for 12 years. After that he moved to the ANEW Choice Assisted Living facility in Menasha where he was loved and cared for around the clock by some of the most wonderful people on the planet. Steven will be welcomed in heaven by his mother Helga Minna (nee Schuetze) Anderson, his grandparents Anna Lili (nee Maas) and Eduard Gustav Schuetze and Annie Maria (nee Logan) and Bert Henry Anderson, Uncle William Elmer Rownd, and Elvis (The King). Surviving family members include Steven’s father, Bert Thomas Anderson and step-mother, Celia Maria (nee Lobo) Anderson, siblings Fredrick William Anderson and Dorothy Ruth (nee Anderson) Witzeling and brother-in-law Daniel Edward Witzeling. Also surviving are one uncle and two aunts, Ursula Dorotea (nee Schuetze) Rownd, and Hans and Stephanie Schuetze. Steven has two nieces and many more distant family members and friends both here and abroad. We can’t forget to also mention Steven’s life-long friend, Steve Single. The two Steves were inseparable for decades. You may have seen them at Badger hockey games. The family has decided to hold a memorial service at a later date, in the spring, in Madison, where family and friends can gather. Very special thanks go out to the staff at Community Care and at ANEW Choice Care, Inc., for the years of caring, attentive service. In lieu of flowers, please send a donation to your local Down Syndrome Association.